Have you seen the #T4T or #Thinkbabies? This advocacy effort of The North Carolina Early Education Coalition (NCEEC) encourages everyone to think about babies! 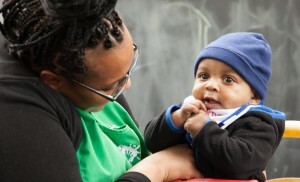 Next week on April 9th, during the national Week of the Young Child, NCEEC is bringing babies, parents, early educators, and other early childhood advocates to Raleigh to call attention to what babies and families in North Carolina need to thrive. This free family-friendly event takes place from 10-1pm at the Halifax Mall at the NC General Assembly, Raleigh, NC and is one event you don’t want to miss! Join The Partnership, NCEEC and “strollers” next week to shed light on how important babies are to North Carolina. It’s time to Think Babies – for stronger families, vibrant communities, and a prosperous future! When we support our youngest children in having the opportunity to fulfill their potential, we create the best outcomes in health, education, and economic well-being for everyone in North Carolina.